From the hit film Ant-Man comes this brand-new cinematic collectors’ piece, courtesy of Sideshow Collectibles and Hot Toys. When ex-con man Scott Lang, is armed with a super-suit that has the astonishing ability to shrink in scale but increase in strength, he must embrace his inner hero and help his mentor, Dr. Hank Pym, pull off a heist that will save the world against the Yellowjacket. Not a bad way to usher in the holidays, right? The Cosbaby Series is rounded out with this pint-size Ant-Man bobblehead. Standing 3.75 inches tall, he’s the perfect gift for the Marvel buff in your circle. You can also use him to deck out your desk and make your workspace a little merrier. Order now by clicking on the photo below! This new addition to an already hotly anticipated series is about to change your collection in a way never seen before. We’re excited to introduce the Marvel Legends Ant-Man Exclusive Series Ant-Man Black Costume Variant. If you’re already set with the Ant-Man Build-A-Figure series, you won’t want to miss out on this guy, featuring the beloved Ant-Man but with a special color-way and outfit that’s never been seen before in this format. The ultimate Marvel Legends collector will want to snap this up ASAP! Don’t delay — and catch yourself up on the movie for all those water-cooler conversations! We’ll be shipping this guy out this week, so naturally we absolutely couldn’t wait to tell you about him. Yeah, he’s that awesome. Get stoked on one of the best movies of the summer with the Marvel Select Ant-Man (Movie Version). Like your other Marvel Select favorites, he stands eight inches tall, commanding respect with a presence like no other! Interchangeable hands ensure that he’s as versatile as he is menacing. So get your order in to own Ant-Man just as he appears in the Peyton Reed-directed cinematic work — you won’t want to miss out! Don’t you wish you had that many hands sometimes? Monogram has fashioned this “piggy” bank especially for Marvel fans! Check out this seven-inch Ant-Man bust, rendered in exacting detail to make him leap right off your comic-book pages. Although several characters have gone by the moniker of Ant-Man throughout the different years and storylines, he was originally the alter ego of scientist Dr. Hank Pym, who invented an innovative formula that allowed him to shrink to miniscule size. So get ready for the new Marvel film that will debut this summer and nab a bank before they’re all gone! He’s clad in his characteristic red-and-black costume, fists balled and poised for attack. Definitely not the kind of “ant” that buys you ill-fitting sweaters for your birthday every year. Ah, fall. Autumn. That thing before the slew of horrific winds, terrifyingly low temperatures and an absurd amount of layers of clothing that must be donned before you can step outside. It is the hallowed season of sweaters, colored leaves and the controversial enjoyment of warm beverages named after a certain orange fruit. With the advent of chilly weather comes the desire to curl up with someone or something cute and veg out. Here are five movies coming out near the end of 2014 and afterwards to get your to-watch list going — or even give you an excuse to put on actual pants, join the realm of living humans and shell out for popcorn. The plot: Space travelers journey through an intergalatic wormhole. Cosmic chaos ensues. But almost unbelievably, that’s not even the best part. Written by Johnathan Nolan and Christopher Nolan (who spearheaded Dark Knight trilogy), Interstellar will showcase some of the non-linear narrative that has made Nolan’s mode of storytelling so renowned. Or we hope, at least! Filmed in Alberta, Iceland, and Los Angeles in 2013, it will star forces-to-be-reckoned-with Anne Hathaway and Matthew McConaughey. Theoretical physicist Kip Thorne was brought on to ensure correctness and accuracy in the plot, which is much appreciated. Details matter, people! Nevertheless, if you find yourself in need of a quick trip to outer space and back somewhere around November, Interstellar‘s your flick. Our man Peter Jackson is back. This adventure-fantasy work will be the third and last installment in the J.R.R. Tolkien novel-based (duh) Hobbit trilogy. The teaser trailer was just released in July at the ever-epic San Diego Comic Con, and it looked tasty. Basically Smaug is pissed and unleashing his Smaug-y rage on all of Middle-Earth like someone ate the last orange creamsicle in his freezer. Bilbo Baggins, Thorin Oakenshield and the Company of Dwarves must save the world as they know it. Except Thorin is dumb and values wealth over friendship (classic), so Bilbo has to figure stuff out pretty much all on his own. Poor guy. At least we still get to watch the fingernail-biting Battle of Five Armies that will deal a definitive blow to it all! The 11th installment in Marvel’s Cinematic Universe and the much-awaited sequel to 2012’s Marvel’s The Avengers, Age of Ultron might just be worth the wait. Joss Whedon, who directed the first film, scripted this one, too — and will be coming back to serve as director, of course. Age of Ultron sees a post-S.H.I.E.L.D. universe in which the ever-valiant Avengers will have to collaborate to take down Ultron, artificially intelligent supervillain and Avengers arch-nemesis. Here, he will attempt to wipe out humanity with his adamantium-wielding claws. It’ll be coming out in IMAX 3D, of course, and something makes us think that that’ll be worth coughing up extra coin for the most up-to-date Avengers experience. As far as we know, all of the Avengers from the first film will be reprising their roles, and with a cast that includes formidable talent such as Scarlett Johansson and Samuel L. Jackson, we’re in for a treat. Word on the street is that Stan Lee will be making a cameo, too. There are also rumors that a third Avengers film will be in the works for 2018, but now we’re getting ahead of ourselves. Paul Rudd, Michael Douglas and Evangeline Lilly will be starring in this future American superhero classic based on Marvel’s Ant-Man (AKA Scott Lang) and Hank Pym. By the time it’s released, the film will have been in development for a whopping ten years. Hopefully it’s worth the wait, and this labor of love by director Peyton Reed will jump out of the screen and right onto our eagerly waiting, popcorn-littered laps. In Ant-Man, Lang and his mentor Pym work to conceal the Ant-Man secret, which enables humans to decrease in size while increasing in strength. And of course, they must keep the earth safe while doing so. What kind of superhero film would this be if they didn’t? Director J.J. Abrams is still at it, bringing the seventh installment in this series to screen-life next winter. This epic cosmic drama is visioned to be the first of a third trilogy of Star Wars films, and will take place approximately 30 years after the events in Return of the Jedi. It’s filmed mostly in Abu Dhabi and Iceland — how rad is that? John Boyega, Adam Driver and Daisy Ridley star alongside recently acclaimed actors like Lupita Nyong’o, as well as tried-and-true staples like Harrison Ford. The plot is being kept pretty hush-hush as of now, but we do know that the three leads will grapple with the challenges their post-Vader world faces. Go forth, movie buffs! Plan your next year. We’ll save you a spot next to us on the velvet seats. Ok…it is not leaked….Marvel has revealed the first official Ant-Man image at Comic-Con in San Diego. The concept illustration, starring Paul Rudd as the title character, has been designed especially for the four-day festival and released ahead of the studio’s hotly-awaited presentation on Saturday. 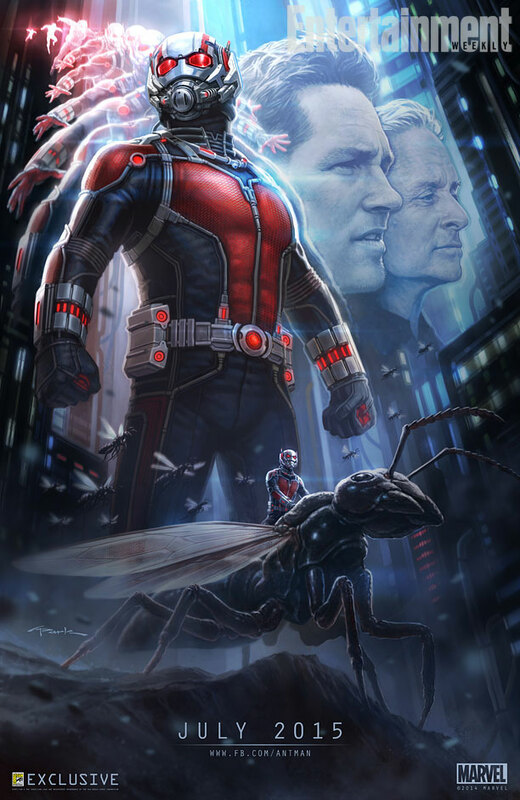 Andy Park’s artwork, hosted by Entertainment Weekly, gives fans a close-up of Ant-Man’s suit, a winged ant and the two leading actors in profile. Production on Ant-Man should have started by now, but when director and co-writer Edgar Wright dropped out over creative differences after eight years on the project, a replacement had to be found. Peyton Reed is now helming the movie, about a superhero who can shrink to minuscule size while increasing in strength and power. Ant-Man, real name Scott Lang, stole the technology behind his miraculous suit from genius biochemist Dr Hank Pym so that he could indulge his thieving tendencies more easily. Nevertheless, his brave, world-defending side will be emphasised in the film. Shooting is scheduled to begin in August, with Michael Douglas playing Pym, who invents a means of communication with tiny creatures. Evangeline Lilly, Patrick Wilson and Michael Pena also star in Ant-Man, set to hit UK cinemas on 17 July 2015.